Getting yourself a dash cam is one of the smartest things that you can do these days. Regardless if you’re a new driver, or you’ve been behind the wheel for years, accidents and unexpected situations arise. During those situations, it does help to have a little backup in your corner, and that’s what dash cameras provide you, plus more. If you’re interested in having one, we’re here to help narrow down your choices as we’re going to look at what the Akaso V1 Dash Cam has to offer. In less than five years, Akaso has made an impressive mark on the worldwide action camera industry. Even though they have more than hit their goal, the company continues to strive to be one of the best by challenging themselves to build new and exciting devices that their customers love. Their expertise, ingenuity, and innovative creations help to keep them at the top of their game. They are also looking to “go beyond” the standard action camera company, and keep up with other world-renown names in the industry while making the efforts to expand into other markets. The Akaso V1 Dash Cam is just one of their action cameras, and it was our privilege to review everything it has to offer. The Akaso V1 Dash Cam is for drivers looking to record what’s happening in front of their vehicle. Anyone who is looking for little extra safety is the ideal customer for the Akaso V1. If you’re a parent who has a new driver on their hands and you’re looking to find out how they’re doing behind the wheel, you also can’t go wrong with the reliability that Akaso provides in their recordings. 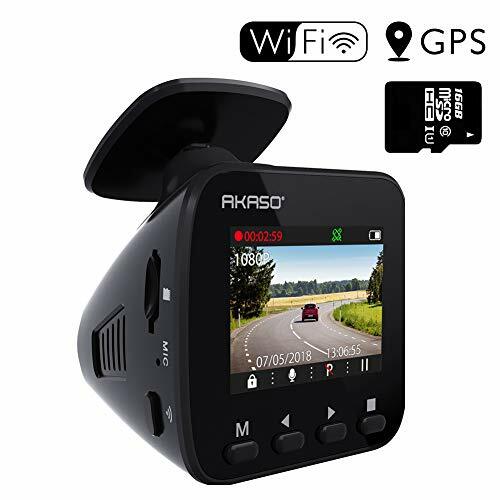 It’s the perfect dashboard recording camera for any driver who wants to feel safe, secure, and protected while they are driving. Amongst the most impressive things about the Akaso brand is that they ensure you receive everything that you need to start recording as soon as you receive your dash camera. There is nothing worse than having to place multiple orders for fundamental pieces of a product just to get the proper use out of it. The Akaso V1 Dash Cam allows you to record your driving track, latitude, speed, and longitude data on its specialized player. All you need to do is contact Akaso, and they will happily send you the package you need to install it. It has built-in Wi-Fi technology that allows you to view what you’re recording in real time, or you can play them or download the files through the Akaso Car app. The app even lets you edit your recordings before you share them with anyone else. What is better is that it also has a GPS system. The Akaso V1 offers a wide range of video resolution such as 1296p, 1080p, and 720p while making use of its advanced sensor to pick up the high-definition images. It has 170-degree wide angle, making it easy to view your blind spots. Additionally, the camera works up to -4 degrees Fahrenheit to 158 degrees Fahrenheit, so you don’t need to worry about the climate, and you will get crisp, clear images regardless if you’re driving during the night or day. The camera also supports up to 128GB Micro SD card in Cass 10+. Discretion isn’t a problem with the Akaso V1’s lightweight and discreet design, and it easily mounts to the windshield where it stays hidden from prying eyes. The dash camera also has a beautiful 1.5-inch LCD with bright colors and features options such as loop recording, G-Sensor, and Emergency Lock. That way, you can rest easy knowing that if a collision happens, your recording footage is locked and won’t get overwritten, even if you run out of storage on your SD card. How to Install the Akaso V1 Dash Cam? Installing and using your Akaso V1 Dash Cam is quite simple. The team truly did a phenomenal job in ensuring that even first-time dash cam users are capable of connecting it with ease. We were able to find a clear YouTube video that details how to install your Akaso V1 Dash Cam, and it also goes through the Akaso Car app, so you can familiarize yourself with that before using it. It was difficult to find an alternative that offers as much as the Akaso V1 Dash Cam for such a great price, but we did look at the Vantrue X3 Dash Cam, and we’re happy with what we found. If you don’t mind spending a few extra dollars on your dash camera, the Vantrue X3 is an excellent alternative for you. Not only does it record up to 1440p, but it has high-dynamic night vision that makes even license plates clear in the dark. The cam also features built-in Wi-Fi and an app that is available on both the Google Play and App Store. It also has auto-recording and G-Sensor features that ensure your camera automatically starts to record in cases of a collision. You are also given the option of a GPS feature, and the device comes with a full 18-month warranty which provides you with ample time to decide if it’s the right dash camera for you or not. Overall, we were thrilled with the results we had with the Akaso V1 Dash Cam, especially for its extremely affordable price point. The daytime recording was crisp and clear, and we got approximately five lanes of view with the wide angle. We weren’t 100% impressed with the nighttime clarity, but that is typically expected with inexpensive models. Nonetheless, the camera and the app are very straightforward and easy to use, and we had no issues with connecting to the integrated Wi-Fi and using the SD card. We were also able to find our recordings, download them quickly, and make all the adjustments that were needed. If you’re looking for an excellent and reliable dash camera for yourself, a friend, or a loved one, we highly recommend purchasing the Akaso V1 Dash Cam. It has definitely made it on our list of favorite’s list!